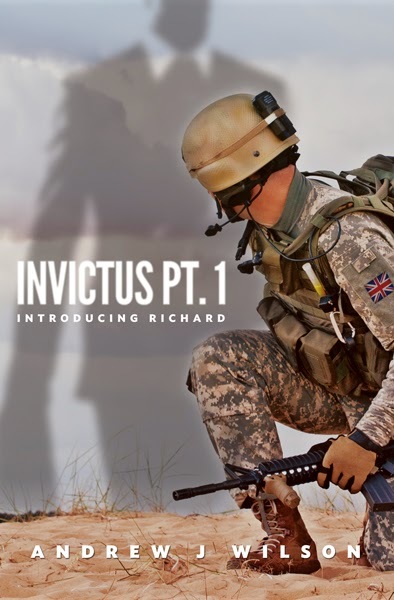 INVICTUS Part 1: Introducing Richard - is going live! Although the original plan was to launch 'Invictus' before the end of 2014, we decided to let it slip into 2015. One of the many benefits to 'Hobby writing' is that deadlines are a lot more flexible, and mainly self imposed; even though I enjoy the pressure, the Christmas and New Year period is probably not a good time to add to drama that the season brings anyway.. There were a few things going on in my private life that demanded my attention so we took the decision to let it slip - well. it slips no more! January 18th will be the release date for INVICTUS Prt 1. The story tells how a well kept secret is suddenly exposed as the result of a failed military mission in Somalia. It examines the 'cause & effect' of miss information, that droplet on the still water that sends ripples outwards in all directions, indiscriminately. Family, friends, careers and complete strangers all fall victim to the aftershock of one bullet. For me this is a great story, a novella, it's almost like a 27,000 word understanding of how Richard gets to where he's going, the emotional baggage that he carries forward, and the consequences of 'that secret'. As an author, I loved writing this because it gave me the opportunity to yet again push boundaries, to experiment with a few different angles on character development. And, it's the first of my books to have a professionally designed cover. Up to now, any and all spare funding was channeled into the editing, the top priority, I was lucky enough to have a little left over in the pot so I decided to invest it in the cover - and I am so glad that I did. By launching INVICTUS Part 1 as an e-book only, the costs are reduced considerably, allowing a few other luxuries (like the cover) to be considered. The long term plan is to have it as a paperback, but we'll see if there is a demand for it. Right behind INVICTUS Part 1 is (strangely enough) INVICTUS Part 2, this will also be released during 2015 as an e-book. Behind both of these is the developing 'Elementals' story, currently sitting at 75,000 words, oh and let's not forget Russian Redemption 2, still sitting at 32,000 words. It is going to be a very productive 2015 - I hope every one of you has an equally productive year, and I wish you all the very best wishes for whatever you want from the new year.